Providing you the best range of dc current sensors and ac current sensors with effective & timely delivery. Linear Range 0 - 150 Amps. 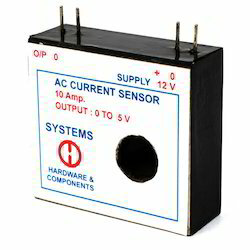 Current Sensor gives isolated DC current output proportional to the AC or DC current passing through. Hi gher current rating can be made available against request. This is a versatile device useful for DC as well as AC high frequency motors. Applications include AC variable frequency motors, DC shunt wound motors, cluthches, brakes of various current rati ngs, airport light controls to plastic moulding machines. Normally current sensors use resistive Shunt or AC Current transformer. These two methods have limitations and disadvantages. Systems new Current Sensor uses Hall effect to sense AC or DC Current. The sensor is to tally isolated from main current and not susceptible to external disturbances. Current Sensor has linearity over the range exceeding one and half times. This gives an ability to withstand the overl oad without damaging current sensor. Further more, electric burden is minimum as there is no resistive element in the series path or no transformer burden as in the case of AC current transformer. Current Sensors are not bulky and size does not increase with the current rating. They are compatible with existing conventional measuring devices.